Sitting on the Gulf of Mexico, Texas is the southernmost state in the middle of the continental United States. The state has about three dozen major waterways including the Rio Grande, the Red River, and Brazos River, and another three dozen seasonal and restricted waterways. Major lakes include Caddo Lake, Sabine Lake, Sam Rayburn Reservoir, and Lake Travis. The tidewater coastline of Texas stretches 624 miles along the Gulf of Mexico. About 6,687 square miles of Texas (less than 3% of the state) are covered by water. The offshore and riverine waters of Texas contain more than 600 historic shipwrecks and countless drowned prehistoric and historic sites. Some of the oldest known wrecks are of vessels sunk more than 450 years. Most are from the 19th and 20th centuries. A few examples are included below. From the early 1500s to nearly 1800, Spanish armed escorts accompanied merchant ships in convoys called plate fleets from the New World to Spain. In 1554, four ships set sail from Veracruz, Mexico, bound for Havana, Cuba, on the first leg of their journey home. Three of them, the Espiritu Santo, San Esteban and Santa Maria de Yciar, were lost in a storm off Padre Island near Port Mansfield. The shipwreck sites were discovered in the 1950s and 1960s, and listed in the National Register of Historic Places as part of an archeological district of national significance. At least two shipwrecks are ships of early explorers. The La Belle and L'Aimable were lost in Matagorda Bay during an ill-fated attempt in 1685-6 by Robert Cavelier Sieur de La Salle to claim and colonize the area on behalf of France and Louis the XIV. La Belle was located, excavated, and conserved by the Texas Historical Commission. The site of L'Aimable remains unknown, but according to historical accounts L'Aimable sank while trying to enter Matagorda Bay through Pass Cavallo. Some shipwrecks in Texas waters are warships from the Civil War, the two World Wars, and other conflicts. One of the more famous Civil War shipwrecks is the side-wheel gunboat USS Hatteras. Built in 1861 as the civilian steamer Saint Marys, the vessel was purchased by the U.S. Navy and commissioned as the USS Hatteras. 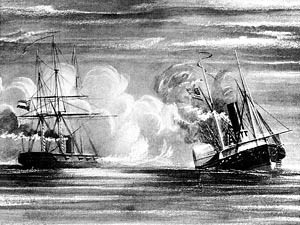 Active in the Gulf of Mexico against blockade runners, the USS Hatteras was sunk in 1863 off Galveston in battle against the even more famous Confederate cruiser CSS Alabama. The shipwreck is a Texas State Archeological Landmark and is listed in the National Register of Historic Places. Who takes care of Texas's underwater archeological sites? The Texas Historical Commission is the legal custodian for all archeological artifacts and sites in the state. Within the Commission, the State Marine Archeologist is responsible for inventorying, protecting, preserving and investigating historic shipwrecks in state waters. A small group of avocational archeologists, known as the Marine Stewards Group, assist the state and are a vital part of the Marine Archeology Program. The Antiquities Advisory Board makes recommendations to the Historical Commission relating to the Antiquities Code of Texas. The state claims ownership to all sunken and abandoned pre-twentieth century shipwrecks and considers them to be state archeological landmarks. The state also protects younger sites that are considered historically significant. To study these sites, you must be a qualified archeologist conducting archeological research and obtain an archeological permit from the Texas Historical Commission. Archeological permits are issued when it is determined to be in the best interest of the State of Texas. Texas has thirteen categories of archeological permits, three of which relate directly to shipwrecks and drowned prehistoric and historic sites. Underwater permits are issued for survey, test excavations, and for large-scale excavations. In all instances, underwater work is conducted by a permitted underwater archeologist, the data acquired is analyzed and a written report is submitted. Other specific requirements also may be included. Any artifacts found on land or under waters belonging to the State of Texas are the property of the state. What laws concern underwater archeology in Texas? The most relevant state laws are codified in the Antiquities Code of the Texas Natural Resources Code, Title 9 � 191.001, et seq. Related regulations can be found in the Texas Administrative Code, Title 13 � 24, et seq. These laws emphasize that it is in the public interest of the State of Texas to locate, protect, and preserve all pre-twentieth century shipwrecks and archeological sites of every character, treasure imbedded in the earth, sunken or abandoned ships and any part of their contents, maps, records, documents, books, artifacts, and implements of culture.